For those who want to change their looks dramatically, hair extensions offer the perfect combination of versatility and length. Although sew-ins are a very popular method of attaching extensions, glued hair is another approach that many people have been experimenting with. 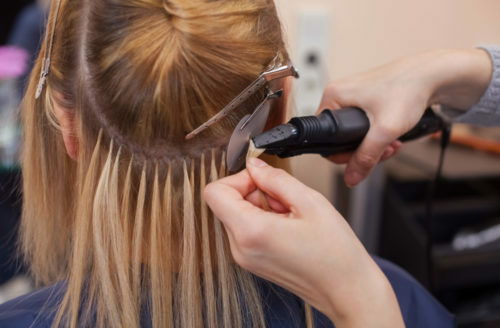 Instead of having to contend with sewn closures or the temporariness of clip-ins, glue-ins allow individuals to apply extensions on a strand-by-strand level. It is not surprising that people have been turning to this option more often as of late. Versatility: The hair can be curly, straight, or wavy. It can also be made from human hair or it can be synthetic. You can even choose between different lengths and colors until you have the combination you are looking for. Polished Final Look: When installation is complete, it is very difficult for people to tell if your hair has extensions in it or not. Long Lasting: Glue-ins can be worn for up to 4 months. This makes them ideal for those who like their hair to be low maintenance. Heat: This technique involves the application of hot glue through a glue applicator. Beyond the risks of getting burned during the installation, heat damage to your hair is another legitimate concern. Potential Hair Loss: Most hair extensions come with a certain amount of risk when it comes to hair loss and damage. Since the glued hair adds weight to the hair and stresses the scalp, breakage and loss is another factor that needs to be taken into account. Price: Although glue-ins can be very cost-effective, the costs of removal and maintenance can add up quickly over time. One way that you can get the glue bonds out of your hair is with oil. You can choose between almond, olive, or baby oil depending on what you can get your hands on. After letting the oil sit on the extension for at least 15 minutes, you should be able to comb the loosened bond out of your hair. If it does not work out, you can repeat the process for as many times as necessary. Although the specifics of this one will largely depend on the type of glue you are using, dish soap is another effective means of removing glue bonds from your hair. Start by taking the dish soap and rubbing it around the glue. To start seeing the results of this method, you will have to let the soap sit for an hour or two. After that has been dealt with, you can start removing the bonds. In order to deal with the remaining soap, just wash your hair out. Believe it or not, conditioner is a great multi-use hair product. In order to use it for glue bond removal, however, you have to start with wet hair. After this first rinse, you need to place a generous amount of conditioner onto your hair and then let it sit under a towel for about 20 minutes. From there, you simply rinse the conditioner out and gently comb the remaining glue out of your hair. If it does not come out the first time, then simply repeat the process as many times as necessary. If you are planning to remove your glue bonds without using a bought removal cream, peanut butter is an excellent substitute. Much like with the three previous methods mentioned, you use peanut butter by first applying it to your glue adherents and then letting it sit for 15-30 minutes. Over time, the glue bonds should loosen and allow you pull them off without too much trouble. The key here is making sure that the peanut butter is given enough time to work. As you can see, although glue hair bonds come with their advantages, there are certain precautions that need to be taken with them. Fortunately, there are a number of ways that glue-in hair extension wearers can affordably remove their bonds. Once you are able to get your glued extensions out, you can try some vintage hairstyles or holiday hairstyles. Here at the Avalon Beauty School of Cosmetology, your hair is our first priority. Contact us to find out more about hair extensions or any of our other affordable services.